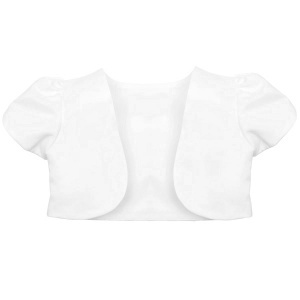 An adorable girls white short sleeved bolero, simply perfect for a christening, wedding, communion or a special occasion. This short sleeved bolero jacket is pure white in colour. It is fully lined with puff shoulders and has a satin effect finish. The perfect compliment to that special dress. Completely brand new with clear packaging. Made in by 'Visara', guaranteed 100% excellent quality. Lovely bolero at a great price. I bought this white satin bolero for my daughters 1st Holy Communion & was pleasantly delighted at the quality & finish. It's a lovely item at a great price, I was recommended it by a friend. This item arrived in a few days and is perfect. Looks beautiful with my daughters communion dresses. This is exactly what I was looking for to match my flower girl dressed, pure white and perfect sizing.. Excellent value for money, would recommend.